Home Lifestyle Health Lulu’s Baked School Lunch Brunch! Lulu’s Baked School Lunch Brunch! Our friends Don and Kenzie hosted another Lulu’s brunch at Fuel Cafe this weekend! They’re hosting these amazing pop-up brunches several times a month now! I had an 8K trail race on Sunday at 2 pm, so I almost skipped it for fear that I’d eat too much and feel gross on my run. But after Don posted the theme/menu, I knew I HAD to be there. They went with a school lunch theme! Square breakfast pizzas (like the shape of the school pizza that fit onto the square lunch tray) and a regional cinnamon roll & chili bowl. The pizza was A-MAZING, and it worked wonders as race fuel later in the day. I wasn’t too stuffed, and I had lots of energy. Yay carbs! As for arugula, I’m not a fan. But I ate it all because I’m a plate cleaner, and I know it’s good for me. 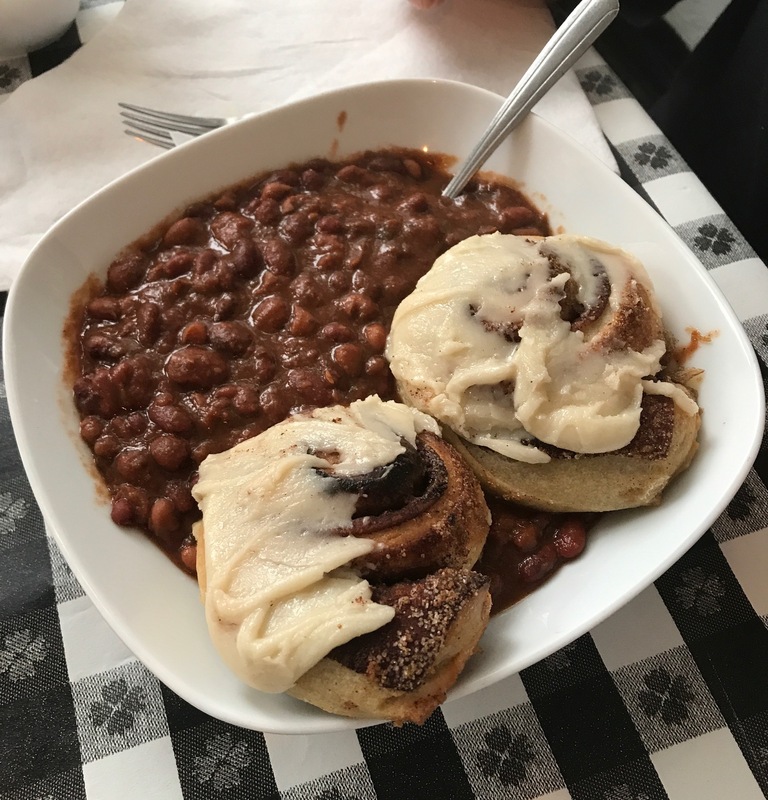 Jennifer ordered the Cinnamon Rolls with Chili, which is something Kenzie ate in school growing up in Missouri. It must be a Missouri thing because I’ve never heard of this dish! But I was very intrigued and totally would have ordered this if pizza wasn’t an option. I love savory and sweet together. By the way, Jennifer — who hails from Michigan and also hadn’t heard of this — immediately pulled the rolls out of the chili and wiped them off, saving them for dessert. Ha! Our friend Anthony ordered this too, and he ate it the right way, taking a bite of cinnamon roll with a bite of chili each time. He said it was delicious. The next Lulu’s pop-up brunch is next Sunday at Fuel, beginning at 11 am. If you’re local, check it out!